In my first official Beauty Buff installment a few weeks ago, I mentioned that I was going to do a Q&A with the infamous ‘Cheryl.’ If you follow along on Snapchat, you’ve probably seen me gushing after my eyebrow shaping appointments with her. So let’s talk all things eyebrows, shall we? One of the first things Cheryl told me (and showed me!) was that she could change the shape of my face by changing my eyebrows. Say what?! I probably rolled my eyes and thought, “Sure you can, lady.” But honestly, after one visit, I was hooked. With a capital H! Heck, all caps! It’s life changing! (A little bit of dramatization, but in terms of beauty, it’s literally life changing!) And during that first visit, I didn’t even know that Cheryl was essentially a celebrity in the eyebrow world. All I knew was that I was laying down, (Yes, laying down to get my eyebrows done! First for everything, right?) wondering what the hell I had just gotten myself into. I’d been getting my eyebrows waxed since probably age 14. I have naturally dark hair and had pretty thick eyebrows as a kid (Which I was embarrassed by back then… It was the early 90’s, after all! ), and probably a little bit of a unibrow. I was always too scared to tweeze them, but I started going to a salon to get them waxed my freshman year of high school. I remember being so nervous about the pain, but weirdo me actually thought it felt good! So 13 years into waxing, I had my method down. I knew that they couldn’t use any cream before or after waxing, just an astringent to minimize breakouts. Yes, even after over a decade of waxing, my skin almost always broke out after waxing. And all of the redness afterwards, yikes! But I just thought that’s what people did, you know? Anyway, I ended up scheduling an appointment with Cheryl since Channing’s was only two blocks from my apartment and I could walk there vs. Uber up to Lincoln Park to Benefit. (I didn’t have a car back then!) It took me a week to get an appointment and I remember thinking that was absurd. I was used to walking in to get an eyebrow wax, definitely not scheduling an appointment a week out! Le sigh. Now fast forward to me living in Chicago for almost a year (crazy!) and I can’t even fathom not doing my brows after I’ve applied my face makeup. I’ve tried and I feel naked without having my brows done! Borderline obsession, for sure. And I giddily schedule my eyebrow appointments a few in advance! But let’s back up… Who is Cheryl? Cheryl Renella is the founder of Channing’s Studio & Spa on Oak Street and has become Chicago’s go-to for all things eyebrows. She was recently recognized for Best Eyebrow Shaping in Chicago by Chicago Magazine and has also been mentioned/awarded in InStyle, Allure, and more. You can read more and see her celebrity clientele here! 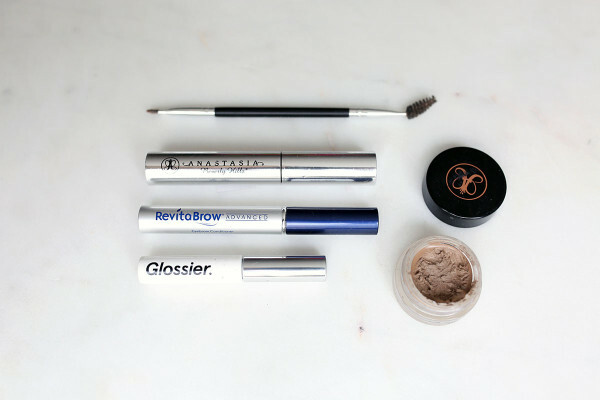 After a few visits, I just couldn’t believe that I’d gone my whole life without knowing these tips and tricks and having Cheryl do my brows. I wanted to share all of this wisdom to the world (well, the world wide web), but since a lot of my readers aren’t in Chicago, I didn’t know if it would resonate. Were there other eyebrow unicorns like Cheryl out there in other cities? What tips does Cheryl have for maintaining your brows at home? I had so many questions and figured you would, too! So luckily Cheryl agreed to do a little Q&A on Bows & Sequins… Enjoy!! Jess: What can a new client expect during their first visit? Cheryl: The first visit starts with a before and after photo (documented on your phone!). Then you will lay down on the massage bed with a mirror in hand as we discuss the shape of your face, the position of your eyes, lifestyle, current shape of your brows, and finally, what vision I have for your brows. All of this before I pluck one hair! Jess: How do you determine which eyebrow shape best suits a client? Cheryl: The shape of the face determines the majority of the direction I take with the shape. Eye position, age, and lifestyle also play a role in the best possible shape. Jess: Why do you have clients lie down during their shaping appointments? Cheryl: This is the best way to see the whole picture… Shadows, highlights, which side of the face is higher and fuller. This will be a 3 dimensional shape vs. 1 dimensional from the side, which is what most technicians use. Jess: One of the craziest things you’ve ever told me was that brows shouldn’t be symmetrical. Can you explain why? Cheryl: One size NEVER fits all, no one has a totally symmetrical face! Each brow compliments the eye it frames. The end result will be symmetrical even though they will be slightly different. Jess: Why not waxing? Eyebrow waxing and threading centers are everywhere, and seem to be most girls’ go-to. (Until they are converted like me!) Why is tweezing the best method? Cheryl: With waxing, you give up control. The wax is applied with a stick to a line of hair. If the wax rolls outside of that line, you get holes! (Editor’s Note: When Cheryl pointed out my waxing ‘holes,’ I was so shocked. They’re there and you don’t even realize it!) I pluck one hair at a time so there are no mistakes in my line. Waxing and threading have one thing in common… hair removal. There is no thought about shape or position. Waxing slows down hair growth or kills the hair follicle and ages the skin. Threading is unsanitary, as the thread is in the technician’s mouth and is rubbed on your skin, therefore you are technically sharing DNA with a stranger. Gross! Jess: I used to be obsessed with having my eyebrow hairs trimmed. They’d feel so long after a few weeks! But you told me that’s a major no-no. Why is that? Cheryl: The trimmed brows of the 90’s are not a great look today. Trimmed brows look like a hedge, a see through line. If the brows are longer and combed over the shape, they look more dense and full. Jess: So after you’ve done your magic while I’m lying down, we always go sit in the chair with a hand-mirror to go over my “no pluck zones” and how to best fill them in. I love this mini tutorial at the end of every appointment! How can ladies learn to properly fill in their brows at home? Cheryl: The most important thing you can do is get a professional shaping with someone who only plucks and ask for a lesson on how and what to use. Education is a big part of brow shaping. Some examples… Thick brows only need a clear mascara, while thin brows do best with a pomade. 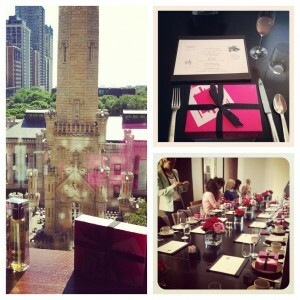 Jess: For my girls that don’t live in Chicago, but want this type of experience… What do you recommend? How can they go about finding someone in their area? Cheryl: Research and referrals are the first steps in getting great brows. Do your homework and search for someone who only plucks! Jess: Let’s quickly talk eyebrow trends. You recently told me about brows that are slightly ombré and how it’s specifically great for girls like me that have different eyebrow and hair colors. What are ombré brows?! Cheryl: The ombré brow is a combination of 2 colors used to create a highlighted, defined look. A darker warm brown to start the brow and a lighter ash brown for a softer finish. Cheryl: Tinting is a fantastic way to change your look. Have a professional tint your brows. Going one shade lighter or darker can make a big difference. I like to make small changes in color, as it will appear very natural. Tinting can also help with grey or white brows, giving you a more youthful appearance. Jess: Is there a specific tweezer you recommend? Cheryl: I love Mehaz and Rubis tweezers. 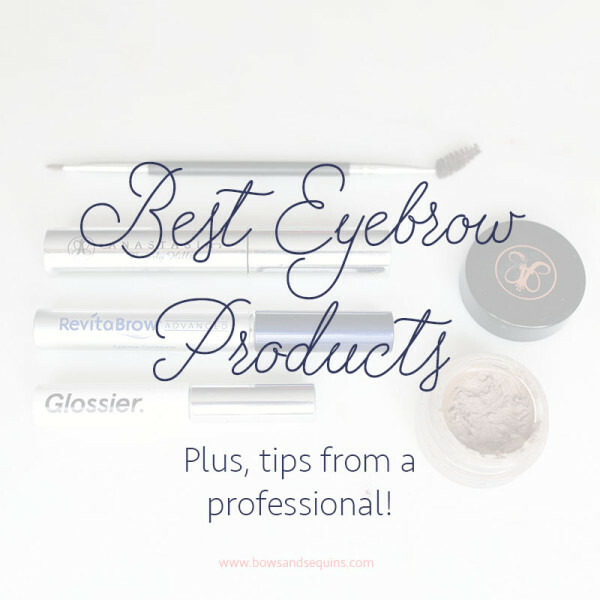 Jess: What are your must-have products for filling in your brows at home? Cheryl: Clear mascara, pomade, a stiff brush, and a tinted color wand. Jess: Okay, question from Jane: What do you recommend for filling in dark eyebrows? Is pencil, gel, or powder better? Cheryl: I like to use clear mascara on dark brows for definition. No extra color is needed. Jess: If you’re trying to grow your eyebrows, are there any products, vitamins, or tips you have for that? Or you can find Cheryl yourself at Channing’s Spa on Oak Street in the Gold Coast in Chicago! Anastasia Brow Pomade: I have the ‘blonde’ shade even though my eyebrows are super dark! Especially if you have lighter hair on your head compared to your eyebrows, it’s a safe bet going a shade or two lighter than you think so it looks natural. 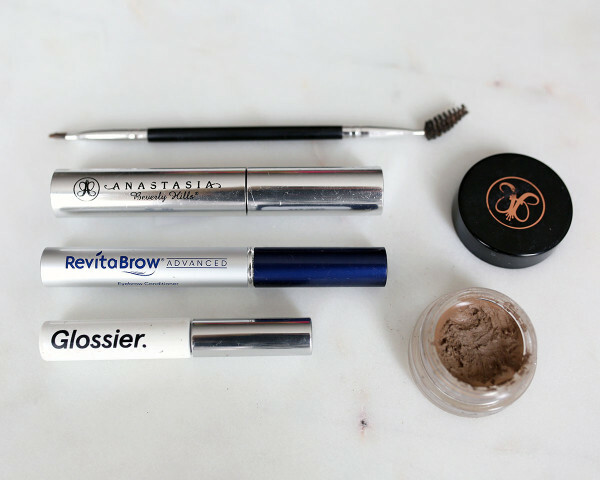 Anastasia Clear Brow Gel: I use this instead of clear mascara… Same thing! Anastasia Brow Brush: Love this because it’s a stiff brush and comb in one! 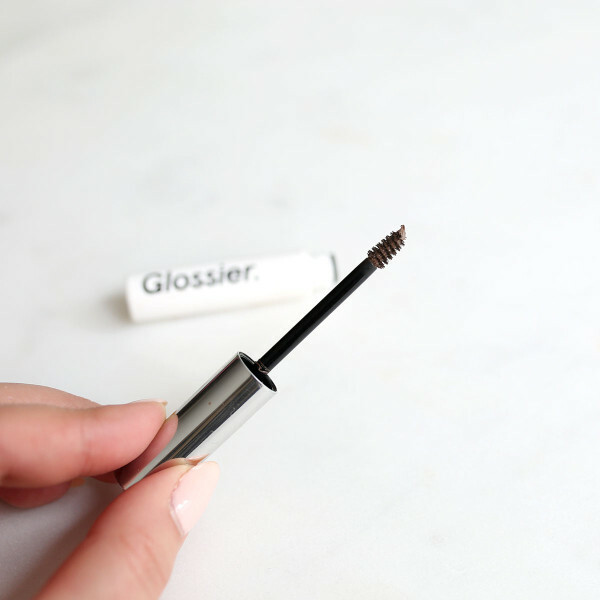 Glossier Boy Brow: This is perfect for days when you don’t really feel like fully doing your brows. Just a few swipes deposits color and has some hold. 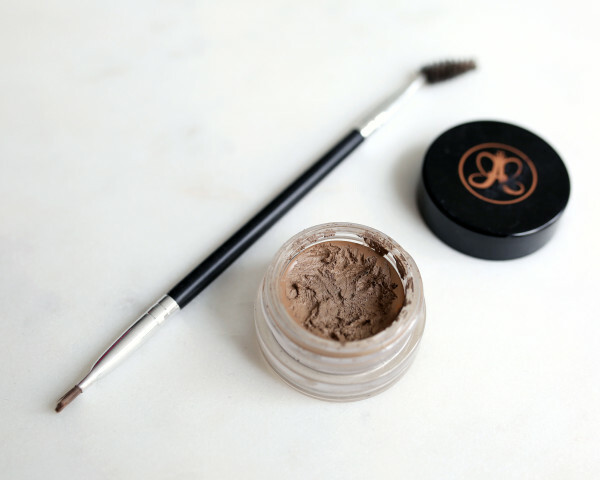 It’s basically pomade + brow gel in one… It’s great! RevitaBrow: From years of waxing, I’ve developed some hair follicles that have basically stopped growing hair. I’ve been using RevitaBrow to jump start the re-growth process! Update: I’ve fallen in love with the Dior Browstyler Pencil, too! (See more about it here in this review!) I wear the Universal Brown shade and you can find it at both Nordstrom and Sephora. Like you, I had thick, bushy eyebrows growing up (what I wouldn’t give to have those back) and I’ve been getting my brows waxed since high school. Fast forward to 2016 and I’m pretty sure I’ve killed some of those hair follicles you speak of because they aren’t as thick as they used to be (and just plain won’t grow in some spots). Ever since I saw your initial Snapchat, I decided to stop getting my brows waxed and while they’re looking a bit rough, I’m determined to find someone here in Kansas City who only uses tweezers – or just move myself up to Chicago 😉 Thanks for sharing all of this! I think I’m going to try some RevitaBrow to see if that doesn’t help the situation I’ve caused for myself. I’m obsessed with the ABH clear brow gel! As a fellow blonde I have the worst time finding brow products that are not too golden. The ABH Taupe, and the Tarte brow products in Taupe (or grey when my hair is more platinum) are my go-tos! I have been waiting for this blog post since you snapchat about it. Worth the wait and worth reading. Also, I have light brows and the hair is sparse, since a child (sadly). So what would she recommend for those and wanting a natural brow look? Excellent read and some great products. I love ABH products – she is the queen of brows!!! Hello, Beauty and Sequins !! You have provide the best tips for the eyebrow threading that help me a lot for my work.